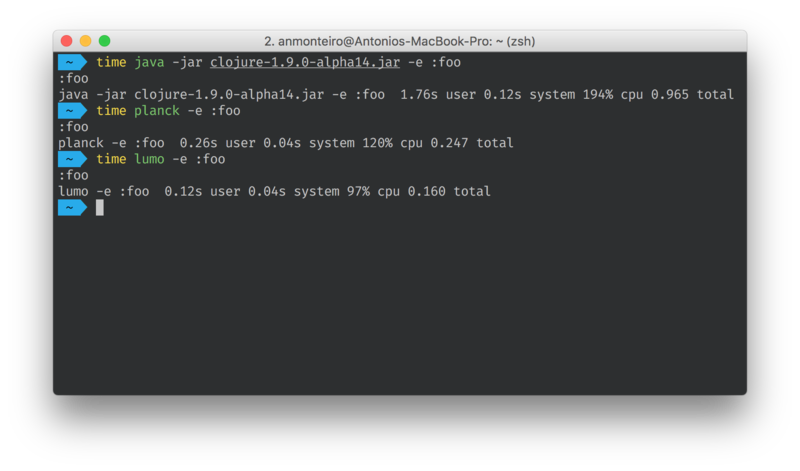 Here is a comparison of Clojure, Planck and Lumo’s startup times. Lumo employs some tricks to be extremely fast, including caching, lazy analysis cache loading and AOT-compiled macros. Lumo is free for use and its code is under an Open Source Software license (Eclipse public license). Using Node.js as a platform means Lumo can run on all common operating systems (Ubuntu, MacOSX) and Microsoft Windows. Node.js has the largest and fastest growing package ecosystem today via npmjs.com. Seamless interoperability with NPM plays a huge part in extending ClojureScript’s reach even further. The startup time of the JVM has been a factor in adoption of Clojure, as starting a Clojure REPL feels slow compared to other tools like node.js. Features planned for Lumo include cursor hopping, pretty printing and colored output, as well as idiomatic ClojureScript wrappers for Node’s APIs, such as performing I/O calls, spawning child processes and more.